We’re not surprised by this at all. Telstra tends to go through at least one to two major or minor restructuring rounds per year, and the cuts that the telco has announced internally appear to help align Telstra’s costs to the more profitable and growing areas of its business (say, for example, mobile, cloud computing and network applications and services), while taking resources away from areas where its losses are accelerating (the traditional fixed line network). From a top-line business perspective, it all makes complete sense, although we’re sure quite a few rusted-on Telstra staff will be annoyed to lose their jobs. At least NBN Co is probably still hiring. I guess we’ll find out eventually whether Telstra’s cuts to its fixed-line network support will affect the long-term quality of its copper network. You only have to look to Whirlpool to see that the previous culling of staff has affected wait times on getting connections completed. There are plenty of threads over the last year complaining about Telstra’s connection times. I for one experienced a wait time of almost a month. In turn I received $360 back from them as part of something the Government inforces. iiNet already covered $240 of the $299 re-connection fee, so I gain $201 for signing up to a 24 month contract. It took them over 16 hours across that month to get it up and running. Surely thats not good for business and is a clear example of what the LNP will face with FTTN on our ageing copper network. It’s ok, Mal has a comeback plan for fixed line (I wonder if he’ll use the theme from Rocky!). I’d say these are mostly office jobs that are being lost, rather than field staff. Many would argue that cuts right across the last decade have affected the quality of the copper network already.Its certainly the case out here in rural areas where Telstra technicians are getting scarcer by the year. 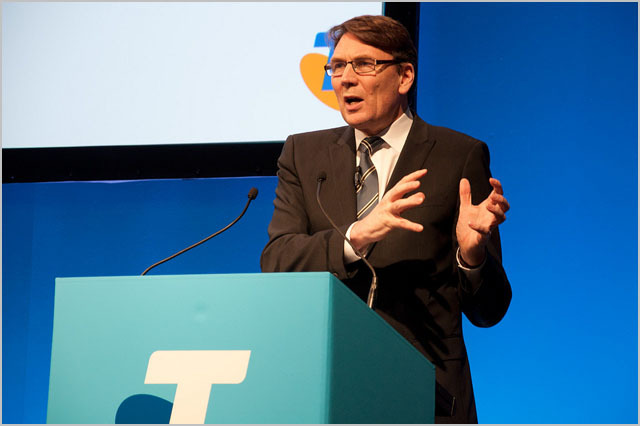 Telstra management have never known what to do in the past, why would they now? If it wasn’t for all the opportunity lost, we’d have an NBN (or half of one at least) by now anyway- at least we’d have Fibre To The Node and be thinking/implementing about Fibre To The Home. Telstra will go the way of Ford without a fixed line revenue monopoly; the very thing it is cutting. Tired old Corps that try but systemically fail (PCCW, et al) at delivering good products and services due to a systemic lack of vision and ability to deliver value as it requires hard problems for management; like doing innovation and real work. Rumour has it fy14 is going to be really bad, big cuts are being planned.